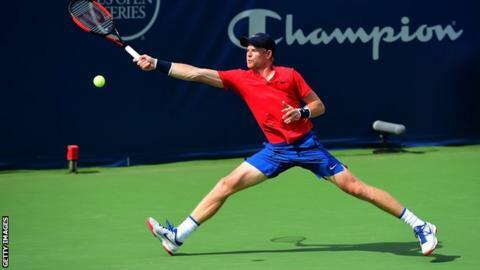 British number two Kyle Edmund lost 1-6 7-5 6-3 to Damir Dzumhur in the semi-finals of the Winston-Salem Open. Edmund, 22, started well and won the first set before being overpowered by his opponent in North Carolina. Dzumhur, ranked 67th in the world, is the first Bosnian to reach an ATP Tour final. The 25-year-old will face Spain's Roberto Bautista Agut in the final, while Edmund will now prepare for the US Open, which starts on Monday. Edmund, who reached the fourth round at Flushing Meadows in 2016, faces Dutch veteran Robin Haase in the first round. "For such a small country as Bosnia, it's a really big result," Dzumhur said. "So I'm proud of my country and proud of myself and it's going to be a good day tomorrow." Bautista Agut, ranked 15th in the world, accounted for Germany's Jan-Lennard Struff 6-2 6-4 in the other semi-final.